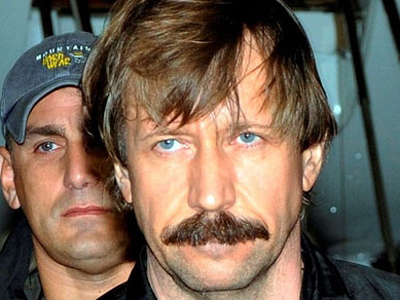 Viktor Bout, who is standing trial in the US for alleged trafficking of weapons, gave an account of the hardships he endured in Thai and American prisons and the sleazy political dealings which may be behind his case. The revelations came from his personal diary, which Bout wrote in US custody and handed over to the Russian newspaper Novaya Gazeta. In his report, Bout says Thailand’s authorities decided to hand him over to the US because the White House promised to turn a blind eye to its persecution of the opposition. In 2010, when the extradition request was being reviewed by a Thai court, the country was shaken by violent riots. “On 23 May, Bangkok was aflame in the wake of the dispersal of a rally [when the Army killed 89 people], 36 buildings had been set on fire, and everything was shut down for 10 days. It was a real civil war. Courts, banks and transport were out of service. The army was going after the red-shirts [opposition activists). Only three judges showed up at the court,” Bout says. The government’s actions against the opposition were condemned at the time by the international community. “The US administration criticized the [Thai Prime Minister] Abhisit Vejjajiva’s government for using force, threatening it with sanctions. And then it all suddenly stopped, as if by magic. That happened exactly on May 23. Perhaps, Abhisit was using my sentence as a trump card: the US would stop twisting Bangkok’s arms, and Thailand would extradite Bout in return…” he speculates. Bout says shortly before that he met with two senior Thai officials who thought he may have information about Thaksin Shinawatra, the former prime minister ousted by an armed coup in 2006. One was a close aide to the prime minister, whose identity is not revealed in the diary. Bout however gives the man’s nickname as “Wallpaper” which he “received for following his boss everywhere”. The other one was introduced as Sirichoke Sopha, a parliament member. He showed Bout an internet article from a Sri Lankan website about Thaksin’s visit to Colombo in December 2004, and his alleged negotiations with the government. The visitors had a keen interest in what Bout had to say about Thaksin’s visit to Moscow, he recalls. They were also interested in any information about Russian intelligence agents operating in Thailand. Bout says he was unable to help the visitors with either of those requests. “Generally, it was an interesting conversation. Why would the Thai Prime Minister… send his assistant to a see a prison inmate? I found out the answer later on, after August 20 , when the Court of Appeal announced its decision, which was dated May 23,” Bout recalls. The defendant also describes some episodes of his incarceration in Thailand, which he felt was aimed at intimidating him. He says the prison’s administration wanted to transfer him to a cell in another block with a clear view of death row. “[The guards] packed my belongings, put me in a minivan and drove around the prison’s perimeter. They stopped at a building which was marked ‘Execution Block’. It looked newly-built, with a lawn and flowers around, and a pond nearby. They took my belongings inside. There were several rooms: behind a window, there were three metal beds equipped with fasteners, which are used for giving lethal injections, and across a hallway there were three single-man cells,” he says. Bout complained about other things he faced while in Thai custody and particularly about the way he was treated during his transfer to the US. He was given dirty clothes instead of what he wore in his cell, and was stripped and photographed naked, and generally handled like “a package”, he says. “In the airport, they took me to a VIP lounge. That is where the ‘transfer’ took place, in one of the rooms. American special agents put their signatures on some document that I never got to see. They didn’t read out any verdict or legal rationale to me. For them, I was merely a commodity, a package rather than a human being,” Bout says. The Americans wanted him to co-operate and tried to scare him, he says. They said a Russian assassin has been dispatched to ensure he never made it to the US. “[DEA agents] told me they would reduce my sentence and recommend that I should be placed in a ‘good’ prison, if only I would co-operate with the investigation. I was specifically expected to start assisting them and telling them about my ‘connections’ once I’d realize that Russia wanted me assassinated – that is why I had to wear a helmet and a bullet-proof vest all the way until I was on board a plane. I replied, ‘Gentlemen, since you’ve read my rights where it says that I have the right to remain silent, I’m certainly going to use it’,” the diary says. Viktor Bout gave a vivid description of his life in a US prison, where he was held in custody during court proceedings. “[When we got to the correction facility], they locked me up in a cell, took off my chains and shackles, and told me to take off all of my clothes. Then they inspected my bottom (which was very humiliating, especially since it happened every time I was taken to court), my tongue, mouth, and hair. They gave me an orange overall, an orange T-shirt, socks, Chinese slippers, and there I was back in a cell, with handcuffs on,” he says, describing his arrival. Bout says the US prison resembled nothing more than a psychiatric ward. “The guards were doing their job: you could only move around wearing cuffs, and if you were to go to the medical department, you would also have to wear a belt with a chain, and shackles. No talking was allowed, they just gave me food three times a day and took me to meet my lawyers and my wife. It felt like being locked up in a mental institution,” Bout says.